Tuesday was a beautiful day. Clear blue skies and a warm sun. 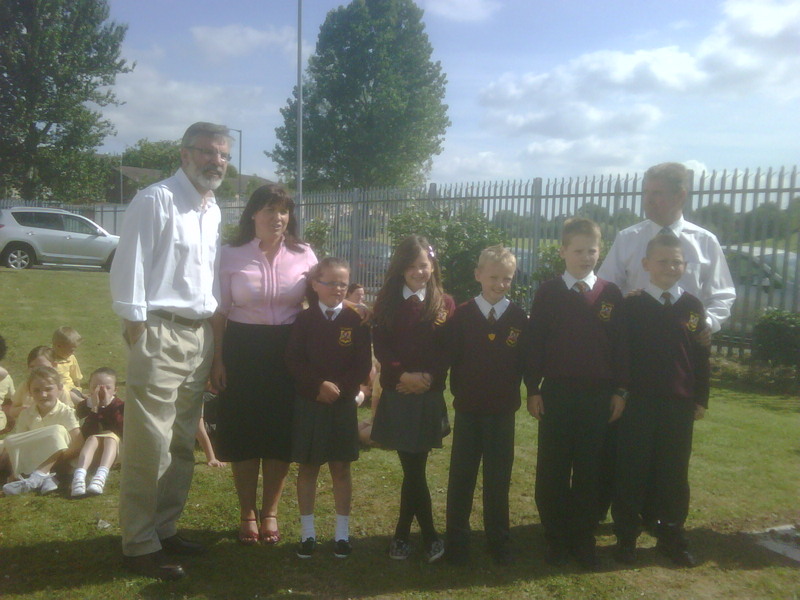 I arrived at St. Luke’s Primary school in Twinbrook at 10 am as arranged and the teachers had already arranged for scores of children to be sitting on the grass. There were also some of the school teachers and representatives from local community groups. 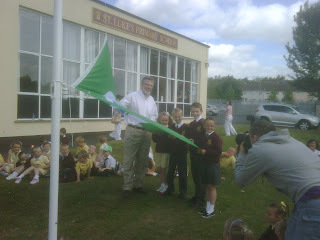 I was there to raise a flag – or hoist - as I was told by the Deputy Principal Mr. Shannon. 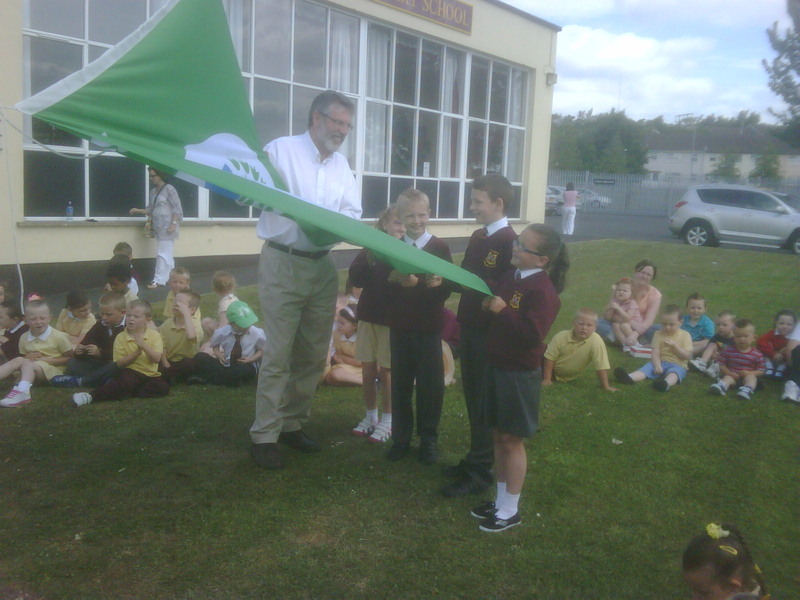 In this case a flag demonstrating the schools commitment to a positive environmental agenda, and its success in winning the Eco- Bronze award. St. Luke’s has taken up environmental issues in a big way. The teachers and children are committed to improving their school and local environment. And as part of this St. Luke’s became involved in an innovative and unique project called the Eco Schools Award scheme. This was created after the 1992 Rio Earth Summit on the environment. At that time issues like climate change and pollution were really beginning to make a big public impact. The Eco Schools project rewards and accredits schools that have made a commitment to continuously improving their environmental performance. It is also a learning resource, raising awareness among children of environmental issues through activities that link to curriculum subjects. 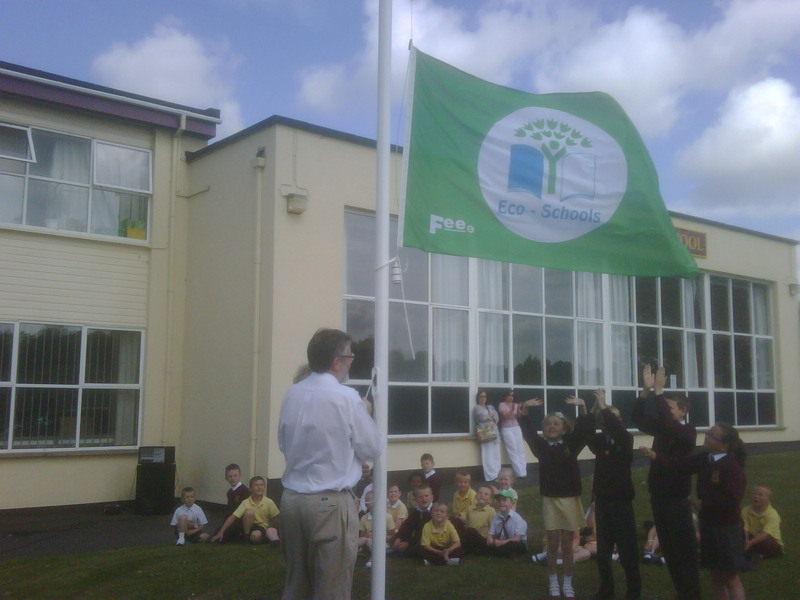 The Eco-Schools programme in the north addresses a range of issues, including Biodiversity; Litter; Waste, Energy; Healthy Living and School Grounds. Claire Robinson is the headmistress and she and Kevin Shannon the deputy Principal are very enthusiastic about the Eco-schools scheme. The pupils are equally enthusiastic and together the Pupil’s Council, the pupils and the teachers identified a whole series of ways in which they could make a positive difference to the school environment, as well as making it a safer place for those who use it. And the ideas seem so simple. Recycling old and used exercise books and paper. Switching off lights, computers and other equipment when not being used. Providing more bins in the playground to reduce litter. Having a ‘healthy break’ policy for the whole school. And composing and displaying a ‘school eco guide’. 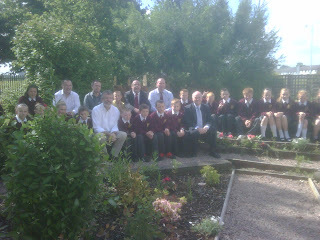 As a result of all this St. Luke’s won the Eco-Bronze Award. And it is well deserved. This blog commended all the pupils for their trojan efforts and told them how the day before a ‘bag lady’ had visited Parliament Buildings to raise awareness around society’s over use of plastic bags. I explained how plastic bags don’t decompose and can stay in the ground for centuries. I asked them to try to not use plastic bags and if out shopping with their parents to ask them to use an environmentally friendly bag. 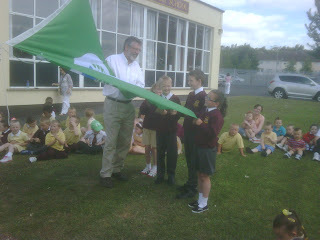 Then a few of the pupils to join me and raised the flag. 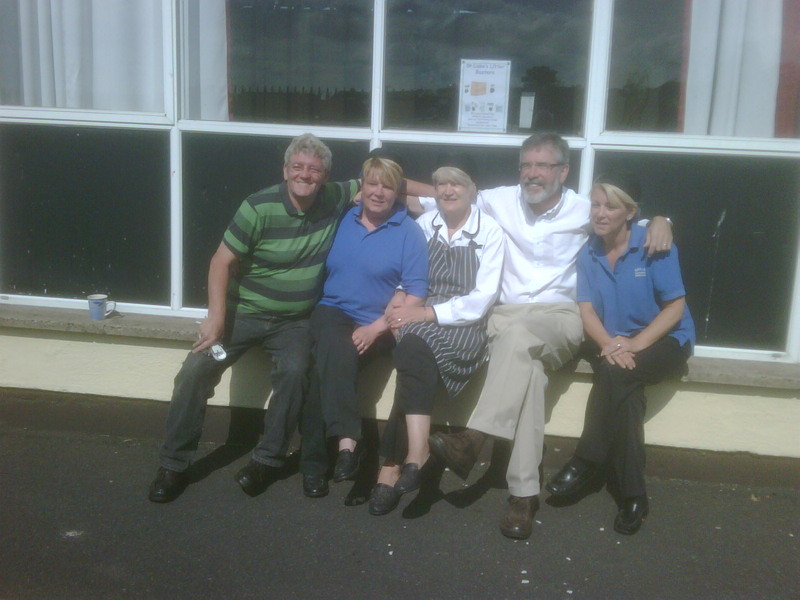 After the formal part of the event was over I met some more of the teachers and also some of the school staff who help make St. Luke’s a successful and enjoyable learning experience for the children. 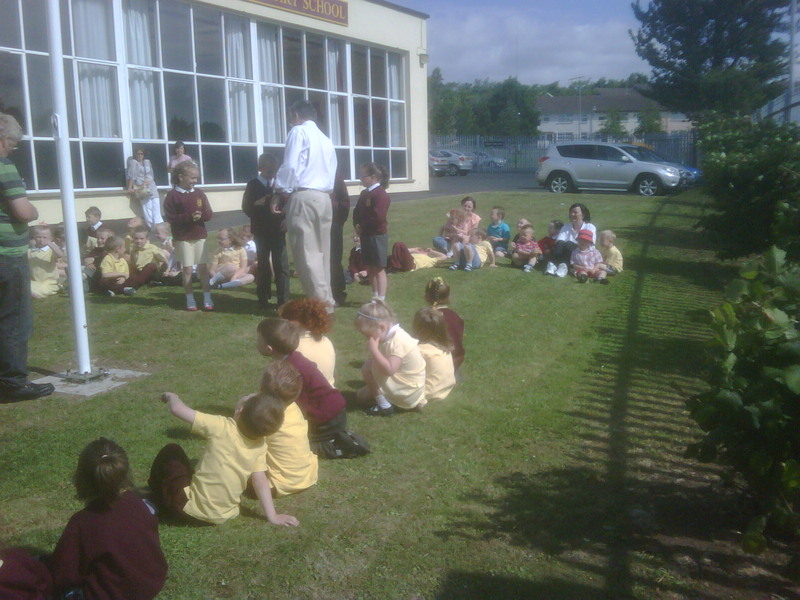 We walked over to look at the new ‘outdoor learning environment’ which was created as part of the Eco-Schools project and which the children were very involved in designing. This is essentially a garden with bird boxes and bird baths and a place for growing vegetables and herbs and flowers. 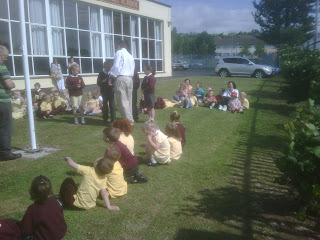 It was obvious that the teachers and the children thoroughly enjoyed the Eco experience. The teachers were full of praise for the pupils and told me stories of groups of children cleaning up local litter, clearing away glass, and on one occasion returning to the school with a toilet cistern that someone had just thrown out. On another occasion when the school was holding a religious service in the adjacent St. Luke’s chapel, one young girl arrived with an armful of empty cider bottles that she had found on her way there. Such dedication! The Eco Schools Project has obviously caught the imagination of pupils and teachers and those local community groups like the Housing Executive that have helped the school win this award. 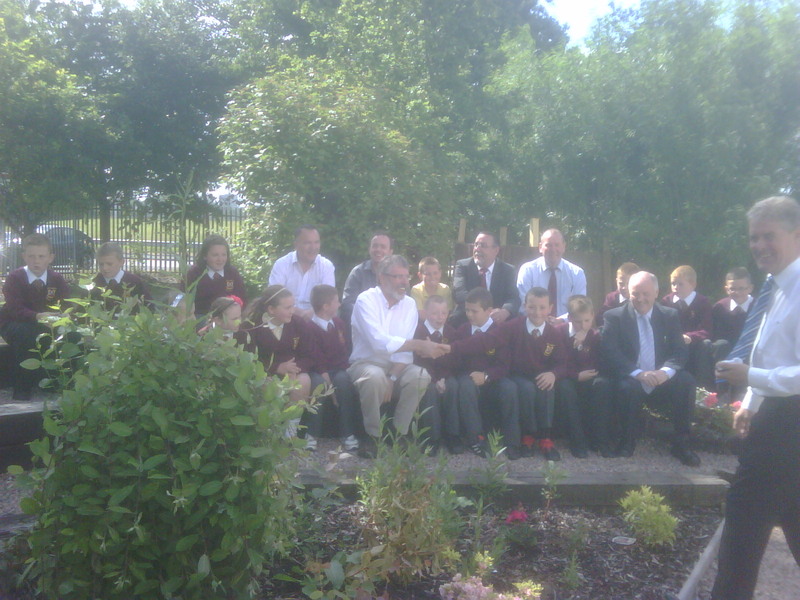 This year it was the Eco-School Bronze Award. Next year they are aiming for the Silver Award. 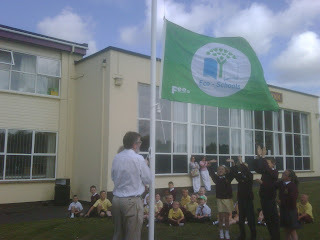 The Eco Schools Project , and commitment to continuously improving their environmental performance. A fine concept Gerry. We never know the worth of water till the well is dry. ~Thomas Fuller, Gnomologia, 1732. Reading on the Irish headwave :Irish heat wave leads to drought conditions Hottest summer for 130 years now forecast.Donegal, Sligo and parts of County Dublin have all reported depleted water supplies, and the council has now imposed water restrictions asking residents to reduce their consumption by 10 percent. A warning that water supplies are seriously low after the unprecedented warm weather over the last month. It seems that this warm weather is set to continue for most of the summer. I like this Native American Proverb:~ We do not inherit the earth from our ancestors, we borrow it from our children. Very well done to the children and the staff at Saint Lukes and to yourself for supporting them in this positive and progressive initiative. We all need to care more about our physical environment. That's for sure. And we need, I believe, to better care for our spiritual/mental environment too. And I feel that that means taking a stand against institutions that willfully promote inequality and by enlarge mysogeny, and the devastating effects of that played out in family relational breakdown and the alcohol and substance missuse. A happy family is one in which the mother is happy. Not treated like an inferior being. This is the kind of environmental action that could make a huge change to the quality of all of our lives in the community and bring revival to Belfast, the like of which hasn't been seen in over a hundred years. And Sinn Fein is the party to do it. Congratulations, St. Luke's! Now, what the rest of us need to do is figure out a way to get away from petroleum-based fuel. If we keep having oil spills like the one in the Gulf, there won't be anything left of this planet to hand down to the next generation. Gerry, I hope you and Sinn Féin will keep pressing for clean energy, especially wind energy and hydroelectric power. It would be great to see the famed "emerald isle" emerge as a leader in green technology!